How we can satisfy the needs of today's companies while still retaining the character of our cities. Seattle’s unprecedented economic growth has made it a global destination for real estate development. The region’s economy, defined for decades by its maritime, timber and aerospace industries, has rapidly evolved to be tech-focused and creative-driven. With Amazon and Microsoft attracting an enormous pool of software engineering talent, and Silicon Valley companies, such as Facebook, Uber and reportedly Apple, in the midst of setting up larger, self-contained operations in Seattle, our city’s tech boom may only be getting started. The surge in tech-employment presents both ample amounts of opportunities and challenges, the majority of which have been well documented by the media. One issue I worry isn’t making headlines is the widely embraced “out with old, in with the new” approach being applied to local development. Such a strategy is erasing Seattle’s architectural history, especially heritage commercial buildings. With an influx of capital continuing to pour into Seattle, we have the chance to rethink our approach to urban development and hopefully reduce the amount of heritage commercials buildings being demolished. The effort begins with recognizing existing buildings’ role in maintaining the vitality and character of our neighborhoods and continues with finding solutions to adapt them to meet the needs of today’s companies. The potential of innovation districts rests in their ability be an integral part of the greater context of the city, incorporating residential, office and retail to create the ideal urban lifestyle for locals to live, work and play. Amazon’s growth has altered the synergy between the tech giant and surrounding startup companies. One unforeseen consequence is skyrocketing rents leading to an exodus of these smaller enterprises, and the office buildings their employees once occupied quickly being demolished to make way for even more new office buildings to be leased by Amazon. Tech startups displaced from South Lake Union have spread out across the city to find office space. Hot spots include neighborhoods surrounding Seattle’s central business district (CBD) such as lower Queen Anne, the waterfront and Pioneer Square, as well secondary markets slightly more removed from the CBD, like Fremont, Capitol Hill and Ballard. In most instances these companies are moving into Class B office space in heritage buildings. The good news is developers and tenants are starting to place greater emphasis on establishing a relationship with their chosen city. The decision to occupy a heritage building allows startups, not to mention out-of-town companies opening satellite offices, to integrate with the community and carry on the historical and cultural ties to the existing urban fabric. Many startups are offshoots from anchor institutions and companies in innovation districts and rely on the same workforce pool. In establishing their own culture and identity, a startup will often choose a heritage building with the intention of providing a clear differentiation from an urban corporate campus setting. Heritage buildings are often smaller than new developments; however, that may not be a disadvantage. Real estate cost is often the second largest overhead expense for companies and utilization rate is the true measure of efficiency for workplace design. Efficiency metrics have moved from square feet per person to square feet per work group, resulting in smaller office footprints with an emphasis on more interesting mix of amenities and spaces. BEFORE: After serving as an office for Washington Mutual for nearly 50 years, the 1101 Second Avenue office building was left vacant in 2007 after the bank’s collapse. AFTER: MG2’s design team played off the natural state of the building to create an expansive, modern environment set against a refined industrial backdrop. Since May 2015, the space had served as MG2’s corporate headquarters. While companies may be drawn to heritage buildings due to affordable rent, they often fall into Class B (and even Class C) categories of office space and typically lack key amenities, modern technology and sought-after open floor plates. As a result, heritage buildings are in need of renovation to stay competitive. With the right mix of smart design and repositioning strategies, these properties can be transformed into Class A assets. Ownerships groups are increasingly turning to architects to help reposition and rebrand office buildings. A strong market-tailored strategy helps property managers, asset managers and brokers effectively promote their buildings in a crowded commercial real estate landscape. Retrofits have the benefit of requiring a limited capital outlay for improved return on investment. According to recent studies3, reuse projects do not always cost more than new buildings and the return on investment for heritage development is almost always higher. Such findings debunk a long held belief within the real estate industry that the cost of capital required to renovate and adapt buildings is too high for such projects to be considered viable investments. BEFORE: Built in 1992, the underutilized lobby of the 22-story Second & Seneca office building was in need of reimagining. MG2 was hired to revitalize the space into an amenity where tenants could work and socialize. AFTER: To keep the lobby feeling energized, MG2 partnered with Digital Kitchen to create evolving custom content displayed on a mosaic of wall-mounted screens. The space features modern pendant lighting, fluted textured tiles and slated wall sections. The business of heritage development requires an eye for innovative building renovation methods utilizing the most efficient and sustainable technologies available. This is a critical strategy for sustainable urban development as energy efficient modernization will extend the life of a building. Today’s workplace trends inform the programmatic changes for commercial buildings by focusing on important amenities and workspace flexibility. 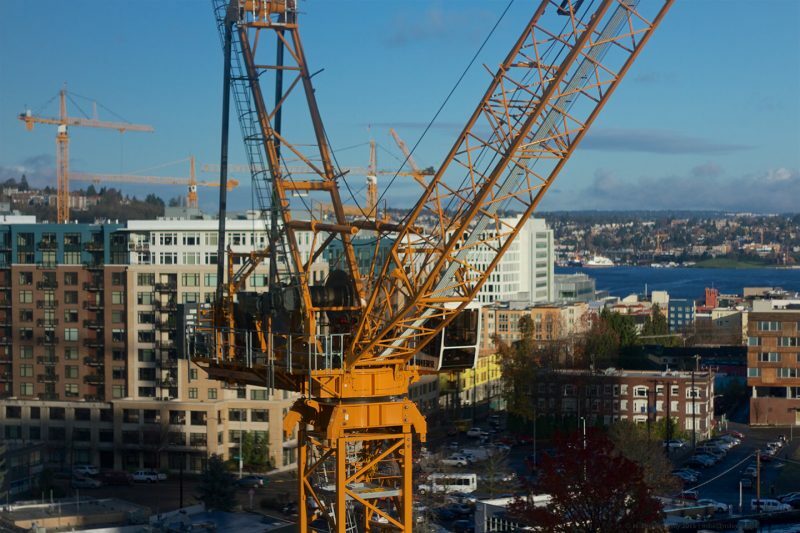 Commercial and residential developers can take advantage of the City of Seattle’s incentive program to introduce additional amenities to achieve extra development capacity. In satisfying the demands of the creative class for unique workplaces, developers have the opportunity to capitalize on the legacy of the existing neighborhoods to create sustainable developments with mixed-vintage buildings. Committing to such a strategy that will foster strong neighborhoods and reflect on the tradition and pride of the great Northwest. 3. Does Adaptive Reuse Pay?